I get a lot of random questions from people here at Psychology Junkie, but one of the most frequent and surprising questions to me lately is how dominant or assertive each personality type is. While every individual has their own unique differences that are totally unrelated to type, I think that there are certain types that are more likely to be dominant or not. But how can you even find out this information? I’m glad you asked! When I took the MBTI® certification course, this was one of the topics that came up in training. It is also covered in the MBTI® Manual. People from all 16 types were tested using the CPI™ tool to determine things like dominance, empathy, sociability, independence, self-control, etc,. 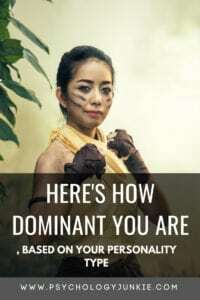 The results of this analysis showed which types scored highest and lowest on dominance, and those results will help to lay the foundation for this post. First of all, what does dominance or lack thereof mean? According, to the CPI™ tool, high dominance means the individual is confident, assertive, dominant, task-oriented. Low-dominance would mean the individual is cautious, quiet, and/or hesitant to take initiative. ISTJs ranked low on dominance with the CPI™ tool. Low dominance is said to mean that the individual is cautious, quiet, and hesitant to take initiative. As introverts and thinking types, ISTJs are very private about their feelings and emotions. They will definitely appear quiet to many individuals. They are also known for being methodical, careful, and aware of security or lack thereof. This would indicate caution. ISTJs also like to have all the facts and details before jumping into a new situation or scenario. This may appear as hesitant to take initiative, but it goes back to being cautious and also needing facts and logical criteria before acting. ISTJs aren’t the most impulsive types. All this taken into consideration, I do find (in my experience) that ISTJs are extremely task-oriented once they are ready to act and they have a clear idea of what they are working with. They can also be quite assertive when speaking their mind and dealing with logical arguments and data. ISFJs ranked low on dominance with the CPI™ tool. As with ISTJs, ISFJs are cautious individuals. They like to know all the facts and details before they act on something. Since caution is associated with low-dominance, this is a big factor in why ISFJs are not considered dominant. As introverts, ISFJs also tend to be more reserved and quiet. They are rarely the types to just blurt out their thoughts or command the attention of people around them unless they have something extremely important driving them. As far as hesitant to take initiative, this would correlate with their tendency towards caution. ISFJs don’t act impulsively except in rare occasions. They like to know all the details and steps before they feel comfortable taking action. Jumping right into something without knowing the sequence needed to complete the task can be overwhelming for them. ESTJs ranked as highly dominant according to the CPI™ tool. These decisive, direct individuals are usually skilled at taking the lead and getting a job done. Signs of high dominance include confidence, assertiveness, and task orientation. ESTJs are extremely goal-oriented and task focused, in fact one of their biggest pet peeves is laziness and lack of direction. ESTJs are also usually quite confident in their viewpoints, and tend to be on the assertive side. They tend to appear direct and frank in their speech and they usually have no qualms taking charge, even in the most chaotic situations. This might explain why they are the second-highest earning personality type in the US. They are usually skilled at climbing the corporate ladder, streamlining projects to get them done efficiently, and seeing where systems and organizations can be improved. ESFJs ranked middle-of-the-road when it came to dominance. These individuals range in confidence, but tend to be very task-oriented people. They like to get started on projects and jump right into tasks to get them completed ahead of schedule. They usually have strong communication skills and an ability to know what “the room” wants to hear, which might give them more confidence than some of the less dominant personality types. They can also be very assertive when it comes to their beliefs, values, and ethics. ISTPs ranked as having low dominance according to the CPI™ tool. This is probably because ISTPs are extremely independent individuals who don’t like to “push” themselves onto others and often prefer to work on their own rather than be part of a team. Because one of the signs of low-dominance according to this scale was being “quiet”, this would also account for their low ranking. ISTPs are usually not especially chatty and prefer to keep many of their thoughts internalized. They are people of action more than words. In their own independent pursuits they can be highly task-oriented, but in organizations they often feel de-motivated, especially if they have to work in companies that have a large focus on bureaucracy and ineffective, traditional methods. ISFPs ranked as having low dominance according to the CPI™ tool. This is likely because ISFPs, like their ISTP cousins, are very independent individuals who don’t like to impose themselves or their agendas on other people. Giving everyone space, both personally and emotionally, is a high priority for ISFPs. They also tend to be on the quiet side, expressing themselves more through creativity and hands-on pursuits than words. They are not usually drawn to leadership positions, although there is always an exception to every rule like this. Many ISFPs crave personal freedom and individuality and believe in giving that to others, so they are less likely to appear dominant than many other types. ESTPs ranked as being highly dominant according to the CPI™ tool. This isn’t surprising as they are known for their confidence, assertiveness, and direct nature. ESTPs are usually ready to jump into new tasks they find stimulating or challenging, and are skilled at getting everyone on board with a project. Their ability to take action is thanks in part to their dominant function: Extraverted Sensing. This function is excited by opportunities for action, real-world experience, and opportunity. Their ability to motivate people is thanks in part to their tertiary function: Extraverted Feeling. Extraverted feeling gives them an ability to read the room, motivate people, and intuitively understand their desires and drives. ESFPs didn’t rank for high or low dominance according to the CPI™ tool. This is easy to understand, as they probably have qualities of both. Extraverted sensing, their dominant function, would give them an eagerness to jump into new opportunities and take action. Extraverted sensing types also tend to be on the confident side. They aren’t known for being particularly cautious, quiet, or hesitant, instead preferring to keep busy, take risks, and live on impulse. That said, ESFPs are usually free-spirits who believe in giving others a lot of personal freedom and independence. Their strong belief in individuality and personal freedom may make the appear less dominant than other types. INTJs ranked as having low dominance according to the CPI™ tool. These independent individuals are usually masters of their own processes and systems and are less interested in imposing those systems on other individuals. They like independent work and can be very good at delegating and leading, but they often prefer to work in their own space without having to deal with the inefficiencies or rules of others. One other reason that INTJs might have ranked as having low dominance is that, as introverts, they tend to be more on the quiet side and being quiet was one of the determining factors of low-dominance according to this scale. They also can seem hesitant to take initiative when they are dwelling in their dominant mental process, Introverted Intuition. When in this phase, they like to explore many different perspectives and viewpoints privately, and they may seem slow to decide or take action. INFJs ranked as having low dominance according to the CPI™ tool. Since the traits linked with low-dominance were being quiet, cautious, or hesitant to take action, this makes sense. INFJs tend to be on the quiet side, and they also tend to be extremely independent. As a general rule, these individuals don’t like delegating or organizing other people. They are much more content to work independently or as part of a team where everyone has a say in what will happen. They can seem hesitant to take initiative because of their preferred process of introverted intuition. Introverted intuition likes to look at many different perspectives and angles before deciding on something. This process of perspective-shifting can take a while, and as a result, INFJs can be slower to decide and act than many other types. ENTJs ranked as being highly dominant according to the CPI™ tool. As the daughter of an ENTJ, this doesn’t surprise me one bit! ENTJs are natural leaders who have a strong desire to organize and implement effective, logical systems. They usually have no problem stepping up and taking the lead if they feel that things are being run inefficiently. They thrive on deciding, implementing structure, and organizing people and systems in their outer world. They also tend to be on the confident and assertive side, which are both signs of dominance according to the CPI™ tool. As far as being task-oriented, ENTJs are extremely goal-oriented and productive individuals. They hate being stagnant or wasting time, and laziness is one of their most abhorrent pet-peeves. Overall, it’s no surprise that these types ranked as being one of the most dominant Myers-Briggs® personality types. ENFJs ranked as being highly dominant according to the CPI™ tool. These goal-oriented individuals can surprise people with their assertiveness, especially since they are more often known for their warmth and empathy. They usually have no difficulty taking the lead and speaking up for a cause if it coincides with their values or a task that will have positive implications for people. They also have a strong awareness of the needs and desires of other people, which gives them an ease and confidence in social situations. They are highly task-oriented and are rarely the types to enjoy being sedentary for long. These types combine a dynamic blend of compassion and assertiveness that helps them to make great improvements in the world. INTPs ranked as having low dominance according to the CPI™ tool. This isn’t very surprising, as INTPs are usually more focused on independent achievement rather than organizing and managing other people. They tend to dislike leading teams and would rather have their own quiet space to pursue their own goals and interests. Since being quiet was considered a trait of low dominance, it’s not a surprise that INTPs got their lower ranking. INTPs tend to be on the quiet side unless they are involved in a conversation about ideas and theoretical possibilities. INTPs can be very assertive if they feel that other people are imposing on their space and their autonomy, but they usually don’t like to be forceful with other people unless those people are being extremely pushy or overbearing. INFPs ranked as having low dominance according to the CPI™ tool. These individuals are very independent in nature, and value autonomy and personal freedom. They dislike imposing their will on others and believe that everyone has a right to their own individual ethics and beliefs. In teaching positions, they tend to dislike grading work or labeling people because they believe everyone has their own unique gifts and contributions that can’t be labeled or ranked. Because of their flexible, individualistic nature, it’s not a surprise that they ranked low for assertiveness and dominance. That said, when INFPs have a task they are especially passionate about they can be extremely task-oriented and determined. ENTPs ranked as having high levels of dominance according to the CPI™ tool. These innovative individuals can be very assertive when it comes to debating or fighting for a vision or idea that they believe in. They also tend to be on the confident side, a trait which, according to the MBTI® Manual, seems more associated with extraversion than introversion (although there are certainly plenty of shy extraverts out there). As extraverted intuitives, ENTPs are usually impulsive and eager to explore new ideas and possibilities. They enjoy jumping into tasks, and adapting to new changes and environments. They are certainly not slow to take initiative in most cases, and are eager to see their dreams become a reality. Their tertiary function, Extraverted Feeling, helps them to sense what other people desire and want. This gives them a leg-up when it comes to persuading and stimulating others towards action. ENFPs ranked as being highly dominant according to the CPI™ tool. These extraverted intuitive types are usually eager to jump into new activities, possibilities, and plans for action. They are known for being motivational and inspiring and aren’t usually afraid to speak their mind, even if it goes against the status quo or what is considered socially “acceptable”. When they have a vision or idea they are aiming for, they can be unstoppable in their efforts and extremely task-oriented. This can surprise many people, who assume that their perceiving nature means they can’t get a job done to save their life! If their passion is behind a project, they can be very creative and ingenious in seeing it through to completion. They are also skilled at motivating others to join them in their pursuits. Do you agree with this article? Do you have any thoughts to add? Let us know in the comments! I’m an INTJ and agree that we’re low on dominance. That being said, when dictators like Vladimir Lenin, or fictitious villains like Emperor Palpatine in Star Wars, or Dr. Doom in Fantastic Four (ironic considering our author’s name) are typed as INTJ, I don’t see it. As an INFP I can see how people would think we lack dominance and/or assertiveness. But its not true for me. I refuse to be a pushover. Because im so in tune with myself and others emotions I know how to get what I want. Sometimes its not a direct approach and sometimes that’s the only way. As an INTP, I disagree. The ENFP portion is so true! If I am passionate about something, it can be hard to get me to slow down and breathe before making decisions. I can get things done extremely fast but only if i love the project I’m working on or if it will help me reach a goal. Thank you for another great post, Susan! It seems you just put all introverts and undominate and vise versa. I too have an ENTJ parent (mother). For the most part it seems right. Many INTJ’s are CEO’s. How are you defining dominance? “First of all, what does dominance or lack thereof mean? The informative value of this article is pretty low. I think doing further research or admitting that a solid statement cannot be made is better than wasting everyone’s time…. sorry.